So I’ve been to Man Mo twice now, which is a little unusual when it comes to me versus Docklands. Yes, yes, it’s all very well and good how VicUrban rescued Melbourne’s forgotten docks from a waterside wasteland… only to turn it into… a waterside wasteland? That’s strong. I don’t mean that. Honestly, though, there are some integral failures of planning: Wurundjeri Way cuts through the whole district as a barrier to movement, the stadium likewise blocks movement between the city and the water, and can anyone say wind tunnels? The Age ran an interesting feature yesterday talking about the challenges for the second decade of development at Docklands. Given that Docklands is dominated by large buildings and a lack of fine grained development, hopefully the second decade will fill in some of the gaps. It will be interesting to see how it pans out. To turn this from an urban planning rant back into a food blog post: I haven’t loved any restaurant I’ve been to at Docklands. My favourite experience has been Mecca Bah, and I haven’t been back there since 2008. Man Mo, the first go, was paid for by my work at the time (also 2008). It must have been an end of financial year sort of shindig. I say this, because through the mists of time all I remember is decent food – we got the banquet – and there was copious, endless wine, that my 22 year old liver was more than capable of putting away but that these days, four years later, would probably give me a migraine for days. Damnit! However, Mr B and I have friends that live in Docklands, so on the odd occasion we must visit for a birthday or somesuch. Man Mo is located in Waterfront City, in that strip of restaurants that also includes Mecca Bah (Moroccan, liked) and Bhoj (Indian, did not). 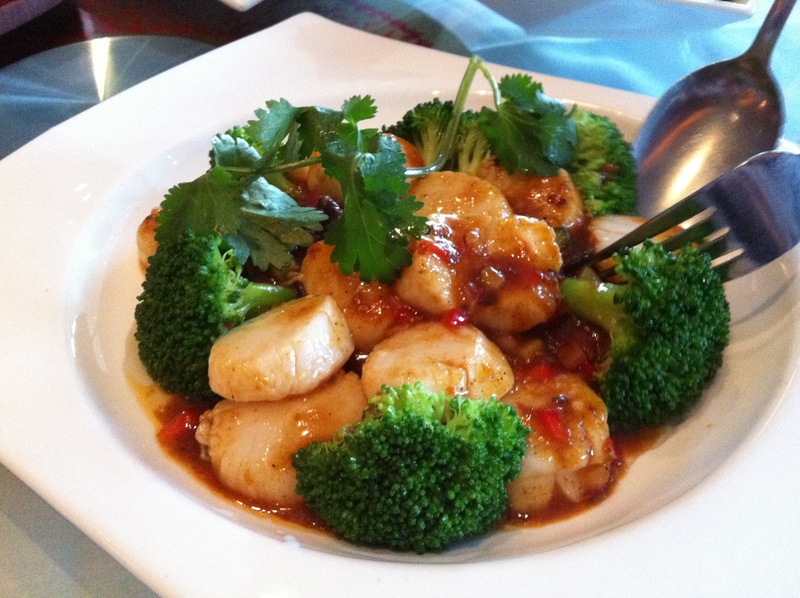 The menu offers Chinese/Malaysian cuisine but leans more towards the Chinese end of things. The staff at Man Mo are very friendly, and service is punctilious, however they desperately want to sell you the expensive “special” banquet. I think they were a bit disappointed when our group of about 10 chose to order random dishes instead, because 10 x $80 = $800 and that’s a shitload of money for Chinese food. Docklands rents must be sky high. Once again I had had quite a lot of wine by the time I ate at Man Mo, so unfortunately pictures are few and far between. 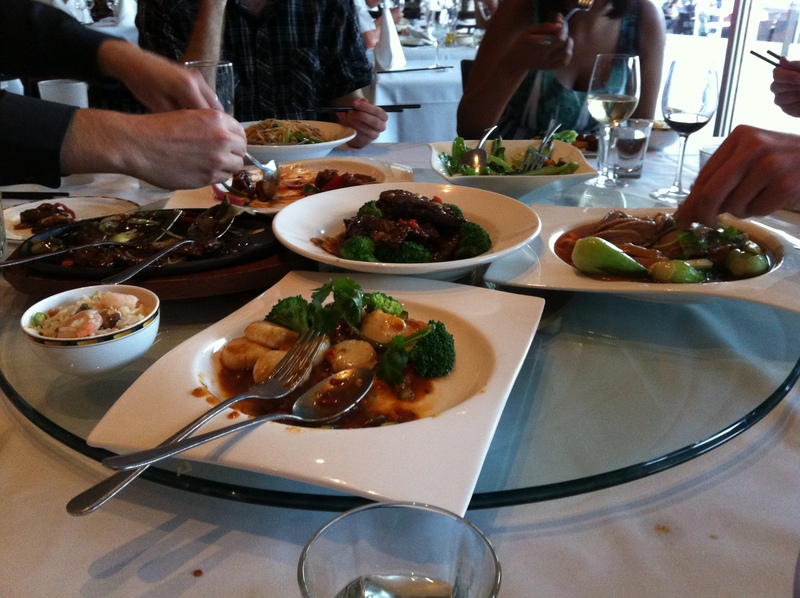 Mains are priced between $20 to $40 (seafood). 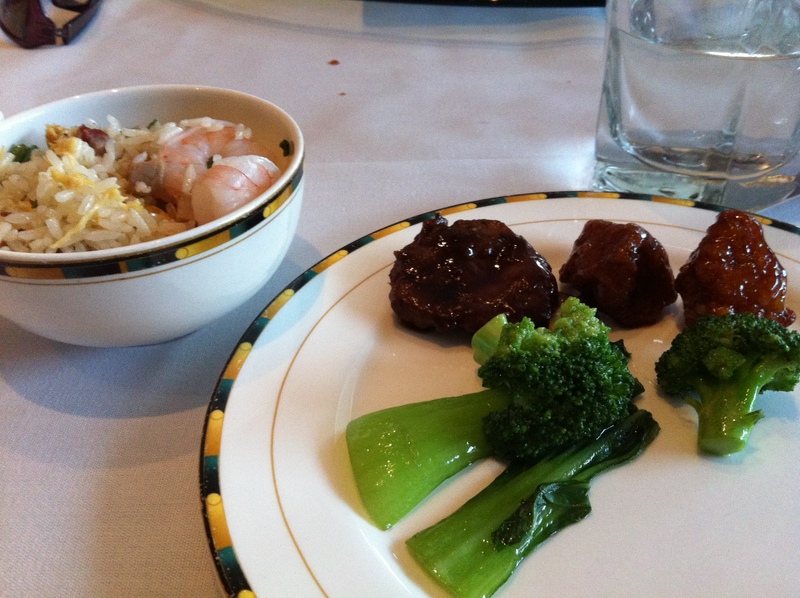 At our end of the table, we had ordered Szechuan beef, sweet and sour pork, Szechuan scallops, seasonal vegetables ($20! ), and fried rice (I think $10 per person!!). There may have been more, but that’s what I got round to eating. I also ordered some more wine for Mr B and myself to share, which was expertly served with a tasting for myself (a little embarrassing as I had simply picked the least exxy red!). A selection of Man Mo's finest: fried rice on the left (really?) and sweet and sour pork and Szechuan beef on the plate, along with some token greenery. The Szechuan dishes were great. The quality of the meat was really a cut above what you normally get, and the flavour of the sauce with the kick of the chilli and the buzz of the Szechuan pepper was excellent. The scallops were cooked perfectly – not rubbery at all. If you do come to Man Mo, I’d recommend ordering one of these dishes. The fried rice had plenty of prawns in it to go some way towards justifying the price. However. The seasonal mixed vegetables are twenty dollars. If I spend $20 on vegetables at South Melbourne Market, I could stir fry up enough to feed a footy team, not half a table of ten! The sweet and sour pork was fine, but I have a weird thing against it as one of those ‘safe white people dishes’ to order. Is it called gweilo food? I wouldn’t have ordered it myself (even though I’m whiter than white as a ranga). In conclusion, the service is great at Man Mo (although Mr Behemoth did walk out of there with some sauce down the back of his work shirt due to a waiter brushing some dishes against him, he complained about it to me but then bought some Napisan… life is tough). The dishes are really cooked well, and the restaurant is beautifully fitted out. I’d just like it a LOT more if it wasn’t approximately five to ten dollars per dish more than I want to pay. However, it’s definitely one of the bright sparks amid the Docklands Siberia. If you’d like a second opinion, the only other blogger review I can find is Because I Can’t Cook, who liked the food and the ambience. Tags: chinese, docklands, overpriced, szechuan, urban planning. Bookmark the permalink.